It is the last day of Intersolar today and I’m feeling it. 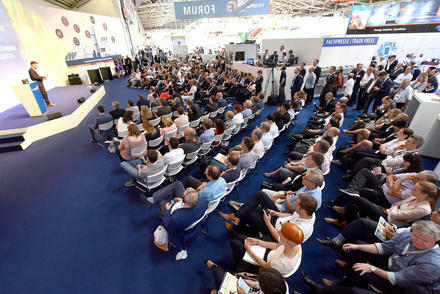 Intersolar is the world’s leading exhibition for the solar industry and takes place annually at the huge Messe München exhibition centre in Munich, Germany. My time here has been great, not only from a business development perspective, but also for my own wellbeing, as I have easily reached my 10,000 steps per day. I decided to visit three of the award winners to understand what makes their products so special. Krinner’s CAS² CAD-based PV system design software delivers cost effective ground screw type mounting for large scale solar installations. Krinner, a pioneer in modern framing construction, established Krinner Solar in 2010. With 600MWp of ground mounted installation experience, Krinner’s CAS² CAD-based PV system design software delivers cost effective ground screw type mounting installations, covering all aspects of the process, from design to installation. Data collected from a preliminary survey is used to design the foundation and, based on the collected results, the suitable ground screw is selected for each point, providing savings of up to 6% in steel consumption per project. During the surveying stage, installation robots and drones collect mapping data, enabling the developer to monitor installation development remotely. This product offers efficiencies for large scale solar installations as well as generating any required documentation post installation. 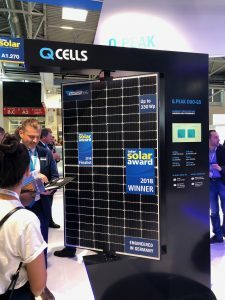 Hanwha acquired a German solar panel manufacture in 2012 to become Hanwha Q CELLS and, together with Hanwha SolarOne in 2015, became a new solar power leader. Q CELLS solar cells have been recognised as a premium solar cell since 1999. 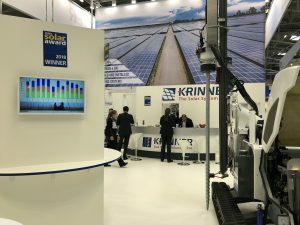 Their reputation for quality has continued over the years, and their 2018 Intersolar award is testament to their embedded quality standard and efficiency. The 330kWp Q.PEAK DUO-G5 panel consists of a 120 half-cell solar module. 19.9% panel efficiency is achieved with six bus bars using advanced interconnecting technology to increase the mechanical stability of interconnection between cells. This cell interconnection offers better resistance to shading and performs well in both residential and commercial applications. In 2014 ABB acquired the Italian based solar inverter company Power-One. At this time Power-One had been a pretty popular residential inverter in Australia, however with this acquisition, ABB also inherited the infamous Power-One E031 inverter fault that cost the business market share. ABB’s reputation was questioned, however over the years the combination of world class engineering and design have resulted in the award winning PVS-175-TL inverter. The PVS-175-TL 1500V DC input inverter from ABB comes with 12 MPP trackers which eliminates the need to use combiner boxes and fuses. This inverter can deliver 185kW at 800 AC which significantly reduces the amount of inverters required in commercial and utility scale projects resulting in great savings and should be available to the Australian market this year. 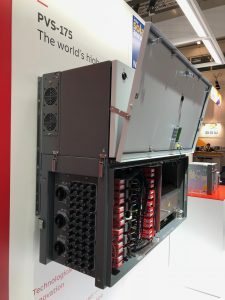 ABB has worked hard on polishing their reputation and has responded to the market’s appetite for high voltage and high-power inverter solutions.